During the 2013 SDCC, Matty Collector and Epic Movie Creations, an adult brand of Mattel announced an official Ghostbusters Neutrino (Nutrona) Wand. Neutrino was approved by some Sony department. At the end of last week, it went on sale to early access subscribers, where Mattel as always noted it could sell out before its launch date to the general public. Ghostheads and anyone else (without an early access subscription) can buy a Neutrino wand beginning today. At some point these will “sell out,” the unanswered question is will they return? Especially if Matty Collector and Epic Movie Creations design and produce a Proton Pack. I wasn’t that on the fence about it and have felt for its features, the price is fair. I won’t order one until at least tomorrow. I will most likely review it, like I have with the Ecto-Goggles. I’m not 100% sure I’ll have it in time for Christmas. 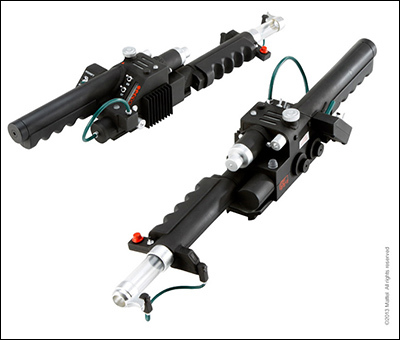 If you’d like to see two reviews, Pixel Dan and AJ Quick have reviewed their Ghostbusters Neutrino Wands. If you live outside the United States and Mattel can’t sell direct to your country of origin, AJ Quick has been selling them in the Ghostbusters Fans shop. Other sites, such as Big Bad Toy Store may sell internationally as well. I would definitely recommend reading the fine print, particularly on Matty Collector before placing a order. I’m taking an informal poll to see if ghostheads have, are or will be buying these. The poll will be open for the next week at least. If you’re a friend of mine, a ghosthead who posts at Ghostbusters Fans, and are my “friend” on Ectocontainment’s Facebook page, you may have read how my Neutrino Wand seemed to be in tracking limbo. This was most likely due to the volume of packages this time of year and not enough help to deliver from the carriers. Which I didn’t know about until the other night. I’ve been doing what I could to follow up on my Neutrino Wand, since I still didn’t know as of this morning I was definitely thinking about blogging about my experience. Great news, I arrived home to see that my mailman delivered a big, sorta long box. I knew it had to be from Matty Collector. It was! I know the carriers can and do work together, since I didn’t know that would be the case, I was somewhat surprised. Like with Mattel’s Ecto-Goggles, I’ll be sharing pictures and writing about it for a future update.